Today should have been a day to write about the Guildford Grow your Business exhibition that happened at the Spectrum. It was a great event, and I really enjoyed being on the panel of the "how I started in business" session, but the thing on my mind, was the Somme like conditions that were being created by the torrential downpours in the garden that we were supposed to be turfing. Unfortunately when the heavens open like they did today, all you can do is wait for it to dry out, The good news is that the long range forecast says it will be dry next week (after the bank holiday, - typical), Lets hope we can do some weeding over the next couple of days as apart from getting very muddy, Ground Elder and brambles are a lot easier to get out of wet ground. What do you do when your son gets sent home from School with a virus , but doesn't stop him running around? - go and plant seeds in the garden of course.... William had only been at School for 1/2 hour when I was called this morning - my only morning off in the last couple of weeks was spent at the doctors, and the playground, - but as the doctor said that there was no need for him to be off school any more (he's past the contagious stage now) we went home and spent the afternoon in the garden. Our link-a-bord raised vegetable beds, with the great topsoil in them thanks to the Bury Hill topsoil that was delivered on Friday - www.buryhillsoilandlogs.co.uk - plus William and Ashley's wheelbarrowing skills, was planted this afternoon with french beans, mangetout, radishes, potatoes, lettuces, coriander and strawberries. The last one is the most important to my 4 year old son, and they were lovingly watered in with his yellow watering can. I'm really excited about my raised vegetable beds, which are 3 times the size of the space I had in the last garden, so i'm going to squeeze in as much as possible. - i'll let you know when I get my first harvest. i've been to see a new clients garden today, - it's just about the steepest garden i've seen, and the soil is fairly inhospitable to plants, and will need lots of enrichment, but the project is going to be great, i'm already bubbling with ideas, and my client had great focus about what she liked and didn't like. Yes to bold shapes and architecture, no to flowers and vague shapes. I was invited into her home which is stylish primary colours and amazing bold artwork, and has given me a great idea as to what plants will inspire her in the garden. Of course I have to work with the soil and light conditions, so the Gunnera and Zantedeschia will be difficult to include unless we create a bog garden. But even before I left, I could "see" a lot of the plants I wanted to use. If you want to move your home design into the garden, create a palette of colours and shapes that inspire you just like a designer would for a living room. I was going to write this post yesterday, but I was a bit steamed up, so decided to wait until today. So what gets me hot and bothered? - Having to dig up dead and dying plants "planted" by landscapers. The garden we were in, had been fantastically landscaped, with a sweeping drive, borders created with wooden posts to follow the contours of the garden, a patio and paths specifically designed so mini cars could be driven round them, and a fantastic climbing frame and fort. These experts in woodworking and patio laying had then agreed to fill the borders, which meant getting a truckload of plants from a wholesale nursery and plonking them into the soil. 2 years on these plants which have been planted too deep, and placed with no consideration for light and shade, or soil conditions, have mostly expired. This is good for us, as we are now going to ensure that the borders reflect the fantastic house renovation and the great landscaping, with colour and interest all year round and a mixture of shrubs and perennials to fill the borders. The consolation is that the dead plants we've removed will go to the great plant heaven of the compost heap. We've had a full day without coats on today, and the weather forecast shows a good run without frost this week. I've started moving my seedlings out from the propagators on the window sills to the greenhouse, but i'll be keeping an eye on the forecasts. I've been pruning Forsythia today, which has just finished flowering . i've also seen the first Lily beatle of the season, - these lovely looking insects are dreadful munchers of all lilies and alstromerias. They are easy to spot and squash. if you find them, you also need to look for their grubs, which cunningly hide in globules of mud like substance on the lily stems, - wash this off to get rid of them. I'm sitting here with a very warm face, from a great day planting a sunny courtyard at the top of a windy hill, with fantastic views. - i'm hoping that spring is properly with us now, and I need to put the sun tan cream in the truck. The borders we've planted today have all had a herb theme. We've put in culinary herbs like Sage, Thyme, Rosemary, Parsley and Chives, cosmetic herbs like Roses, Lavender, Paeonies and Lilies, and Medicinal herbs like Mint, Alchemilla, Echinacea and Santolina. Herbs can be very formal like clipped bay trees and Lavender hedges and very informal like untamed Lemon Balm, and large bushes of Sage. I've really enjoyed using a mixture of ways to combine them, and i'll be adding lots of Herbs to my garden this summer. i'm excited about a big Herb scheme planting that we'll be doing tomorrow. I've been sourcing plants all week, from lots of nurseries, but there are always a few elusive ones, - that's why I was glad when I was told about a discount voucher on Dorset Cereals site that gives you 20% off orders from crocus, (thanks Fiona) just for entering a competition. I've never ordered from Crocus before today, - just always loved their catalogues, but i've taken the plunge, and hopefully will have my first deliveries with me within 2 weeks. William and Sam did plant their sunflowers today. William didn't quite get the hang of only putting one seed in each dibbed hole, so I may have to do some judicious thinning when (if) they germinate. Sam was loving planting seeds, so as well as sunflowers, he did a pot of basil, and some courgettes (with round fruit). The basil was on preseeded grow mats, which are excellent for planting with Children (again Suttons, they've got the childrens seed market sown up!) all their seeds are going in windowsill propagators, which are narrow enough to go on any windowsills, and at this time of year when it's cold outside, it's actually a good idea to have them near to the radiator to get the seeds germinating faster. I managed to sow seeds of my favourite tomato Lidl. These are yellow plum shaped tomatos that i've grown for about 4 years now. They are really prolific and very sweet, but not available from all garden centres, so it has to be Thompson and Morgan online, or from Wisley. As well as these and Gardeners delight tomatos for the greenhouse, i'm also growing 2 new outside varieties of tomatoes, Inca and Ferline and Balconi tomatoes for hanging baskets. I'll let you know how I get on. 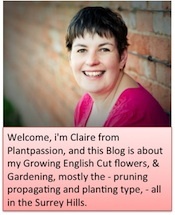 Well here it is, my first blog entry, - i'm setting this up, so i've got a record of what I do in my gardens and in my clients gardens. This has been a good gardening weekend, in amongst the showers of rain, - i've finally planted my Raspberries, (Glen Clova and Autumn Bliss) which I bought before Christmas, before we had the major house renovations, - I'm glad to say that they all seem to be sprouting fine. William helped me, and enjoyed soaking the roots in his Wheelbarrow before planting. - he then stood there in the middle of the vegetable plot and asked me " mummy can you teach me to be a gardener?" - heartwarming stuff from my four year old, and enough to send me off to Wisley to get a pair of Childrens gardening gloves, and a mini spade (which he used to practice spreading about the pile of gravel at the front meant for the drive when we've finished the edging!). We then laid out the spaces for the raised beds that will be arriving in the next couple of days from Harrold Horticulture, worked out which Vegetable Seeds and plants we wanted to sow next weekend, - Carrots for William, Brussel sprouts for Ashley and organic Beetroot and Rocket for me, plus the potatos that have been chitting in the playroom, - It had better be good weather next weekend or else! We were going to plant the Suttons "The great sunflower race" seeds this afternoon, but rain and the fact that William wants his friend Sam as his opponent not me, means we'll do those tomorrow now. He wants them on his window sill, so i've got a window sill propagator for that purpose, - we'll see how he gets on!